Historically, taxing the subject state has been in various forms—usually gold and silver, where those were considered money, but also slaves, soldiers, crops, cattle, or other agricultural and natural resources, whatever economic goods the empire demanded and the subject-state could deliver. Historically, imperial taxation has always been direct: the subject state handed over the economic goods directly to the empire. For the first time in history, in the twentieth century, America was able to tax the world indirectly, through inflation. It did not enforce the direct payment of taxes like all of its predecessor empires did, but distributed instead its own fiat currency, the U.S. Dollar, to other nations in exchange for goods with the intended consequence of inflating and devaluing those dollars and paying back later each dollar with less economic goods—the difference capturing the U.S. imperial tax. Here is how this happened. Economically, the American Empire was born with Bretton Woods in 1945. The U.S. dollar was not fully convertible to gold, but was made convertible to gold only to foreign governments. This established the dollar as the reserve currency of the world. It was possible, because during WWII, the United States had supplied its allies with provisions, demanding gold as payment, thus accumulating significant portion of the world’s gold. An Empire would not have been possible if, following the Bretton Woods arrangement, the dollar supply was kept limited and within the availability of gold, so as to fully exchange back dollars for gold. However, the guns-and-butter policy of the 1960’s was an imperial one: the dollar supply was relentlessly increased to finance Vietnam and LBJ’s Great Society. Most of those dollars were handed over to foreigners in exchange for economic goods, without the prospect of buying them back at the same value. The increase in dollar holdings of foreigners via persistent U.S. trade deficits was tantamount to a tax—the classical inflation tax that a country imposes on its own citizens, this time around an inflation tax that U.S. imposed on rest of the world. When in 1970-1971 foreigners demanded payment for their dollars in gold, The U.S. Government defaulted on its payment on August 15, 1971. While the popular spin told the story of “severing the link between the dollar and gold”, in reality the denial to pay back in gold was an act of bankruptcy by the U.S. Government. Essentially, the U.S. declared itself an Empire. It had extracted an enormous amount of economic goods from the rest of the world, with no intention or ability to return those goods, and the world was powerless to respond— the world was taxed and it could not do anything about it. Many have criticized Bush for staging the war in Iraq in order to seize Iraqi oil fields. However, those critics can’t explain why Bush would want to seize those fields—he could simply print dollars for nothing and use them to get all the oil in the world that he needs. He must have had some other reason to invade Iraq. History teaches that an empire should go to war for one of two reasons: (1) to defend itself or (2) benefit from war; if not, as Paul Kennedy illustrates in his magisterial The Rise and Fall of the Great Powers, a military overstretch will drain its economic resources and precipitate its collapse. Economically speaking, in order for an empire to initiate and conduct a war, its benefits must outweigh its military and social costs. 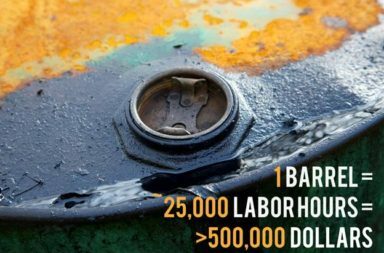 Benefits from Iraqi oil fields are hardly worth the long-term, multi-year military cost. Instead, Bush must have went into Iraq to defend his Empire. Indeed, this is the case: two months after the United States invaded Iraq, the Oil for Food Program was terminated, the Iraqi Euro accounts were switched back to dollars, and oil was sold once again only for U.S. dollars. No longer could the world buy oil from Iraq with Euro. Global dollar supremacy was once again restored. Bush descended victoriously from a fighter jet and declared the mission accomplished—he had successfully defended the U.S. dollar, and thus the American Empire. · Sabotaging the Exchange—this could be a computer virus, network, communications, or server attack, various server security breaches, or a 9-11-type attack on main and backup facilities. · Coup d’état—this is by far the best long-term strategy available to the Americans. · Negotiating Acceptable Terms & Limitations—this is another excellent solution to the Americans. Of course, a government coup is clearly the preferred strategy, for it will ensure that the exchange does not operate at all and does not threaten American interests. However, if an attempted sabotage or coup d’etat fails, then negotiation is clearly the second-best available option. · Joint U.N. War Resolution—this will be, no doubt, hard to secure given the interests of all other member-states of the Security Council. Feverish rhetoric about Iranians developing nuclear weapons undoubtedly serves to prepare this course of action. · Unilateral Nuclear Strike—this is a terrible strategic choice for all the reasons associated with the next strategy, the Unilateral Total War. The Americans will likely use Israel to do their dirty nuclear job. · Unilateral Total War—this is obviously the worst strategic choice. First, the U.S. military resources have been already depleted with two wars. Secondly, the Americans will further alienate other powerful nations. Third, major dollar-holding countries may decide to quietly retaliate by dumping their own mountains of dollars, thus preventing the U.S. from further financing its militant ambitions. Finally, Iran has strategic alliances with other powerful nations that may trigger their involvement in war; Iran reputedly has such alliance with China, India, and Russia, known as the Shanghai Cooperative Group, a.k.a. Shanghai Coop and a separate pact with Syria. Whatever the strategic choice, from a purely economic point of view, should the Iranian Oil Bourse gain momentum, it will be eagerly embraced by major economic powers and will precipitate the demise of the dollar. The collapsing dollar will dramatically accelerate U.S. inflation and will pressure upward U.S. long-term interest rates. At this point, the Fed will find itself between Scylla and Charybdis—between deflation and hyperinflation—it will be forced fast either to take its “classical medicine” by deflating, whereby it raises interest rates, thus inducing a major economic depression, a collapse in real estate, and an implosion in bond, stock, and derivative markets, with a total financial collapse, or alternatively, to take the Weimar way out by inflating, whereby it pegs the long-bond yield, raises the Helicopters and drowns the financial system in liquidity, bailing out numerous LTCMs and hyperinflating the economy. The Austrian theory of money, credit, and business cycles teaches us that there is no in-between Scylla and Charybdis. Sooner or later, the monetary system must swing one way or the other, forcing the Fed to make its choice. No doubt, Commander-in-Chief Ben Bernanke, a renowned scholar of the Great Depression and an adept Black Hawk pilot, will choose inflation. Helicopter Ben, oblivious to Rothbard’s America’s Great Depression, has nonetheless mastered the lessons of the Great Depression and the annihilating power of deflations. The Maestro has taught him the panacea of every single financial problem—to inflate, come hell or high water. He has even taught the Japanese his own ingenious unconventional ways to battle the deflationary liquidity trap. Like his mentor, he has dreamed of battling a Kondratieff Winter. To avoid deflation, he will resort to the printing presses; he will recall all helicopters from the 800 overseas U.S. military bases; and, if necessary, he will monetize everything in sight. His ultimate accomplishment will be the hyperinflationary destruction of the American currency and from its ashes will rise the next reserve currency of the world—that barbarous relic called gold. Krassimir Petrov ([email protected]) has received his Ph. D. in economics from the Ohio State University and currently teaches Macroeconomics, International Finance, and Econometrics at the American University in Bulgaria. He is looking for a career in Dubai or the U. A. E.